The 2013 annual meeting was held in Montreux from 15-16 November, 2013. Electrical stimulation of the nervous system : an overview of the mechanisms of action. 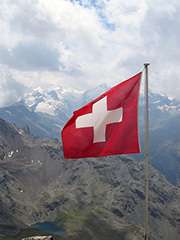 The Swiss Neuromodulation Society and the Swiss Society for Interventional Pain Management held a joint annual meeting in Montreux. It was the third annual congress of the SSIPM and the first for the SNS. The specific focus was the link between research and clinical practice, with the hope to help participants to treat patients better under the light of new developments and updated research. Tools for follow-up: the Århus SCS database and the Danish Pain Research Center model. Spinal cord stimulation for failed back surgery syndrome. Peripheral nerve stimulation for fibromyalgia. Do diagnostic spinal injections improve surgical outcomes? How well is the mechanism based approach replacing the WHO ladder? What psycho-social factors really impact on pain management? Lies, damned lies, and medical statistics?